Hubby recently started stocking up on soy mince because he had heard - rightly - that it was much less fattening than meat. I admit that I had not been keen to try it. I am very much a meat eater! But one evening he cooked for the family, used the soy mince, and guess what... it was nice! The kids ate it without question (we didn't tell them it wasn't meat) and when I worked out the Weight Watchers Propoints value I was sold! So while we haven't given up meat, I do use soy mince instead of meat in recipes that would be very expensive in propoints if we used meat. This tortilla meal is one good example of this. We like it with beans, and rice, and cheese, and dip! Swapping beef mince to soy mince makes it a much lower points value meal. Guilt free! Warm the tortillas in oven on a low heat, wrapped in foil. Cook the rice in salted water and set aside. Prepare the soy mince as directed. Fry the onions, peppers and mushrooms until soft. Add the mince, tomatoes and spices. Stir in the rice and season to taste. Heat the beans in a separate pan. 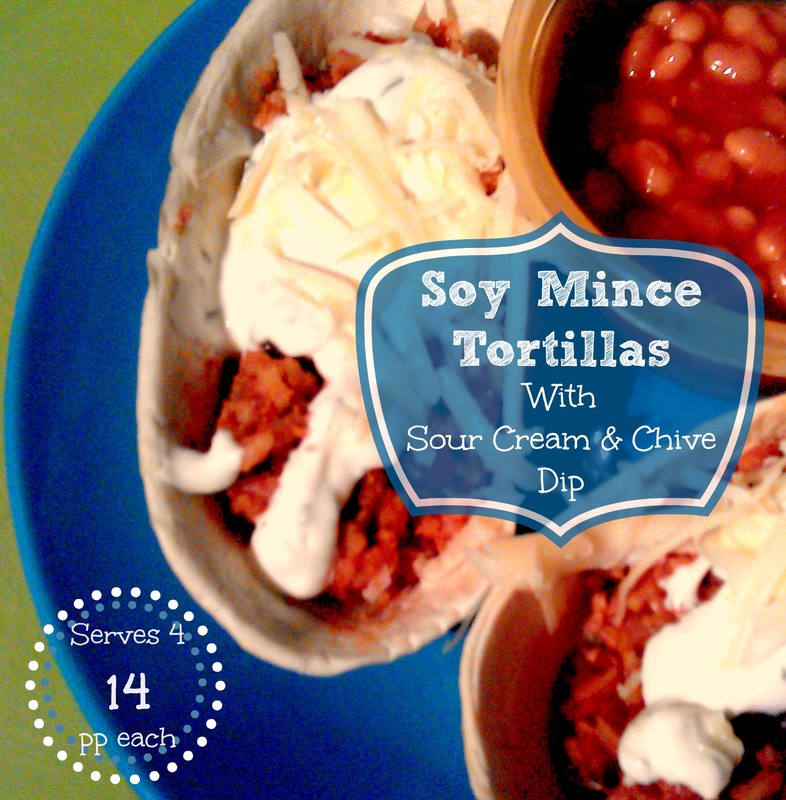 Spoon the mince & rice mixture into the tortillas, top with soured cream dip and sprinkle over with the cheese, serve with the beans.